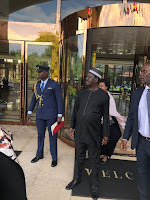 Thursday September 13, 2018 - National Super Alliance (NASA) leader, Raila Odinga, received a Head of State treatment in Accra, Ghana, when he arrived to attend the funeral of former United Nation Secretary, Kofi Annan. Kofi, 80, will be buried in his village after staying in Switzerland for more than 50 years. When he arrived at Kotoka International Airport, Raila was given an Aide De Camp (ADC) and he was seen walking behind the Peoples’ President. Raila was accompanied by his sister, Ruth Odinga, Speaker of the Senate, Ken Lusaka, and Muranga Women Representative, Sabina Chege. Ford Kenya leader and NASA Principal, Moses Wetangula, was also in attendance. Annan passed away in Switzerland after a short illness. His memory is dear to Kenyans because he was among the international leaders who brokered the peace deal leading to the National Accord in 2008 after the post election violence. He served as the UN Secretary General from 1997 to 2006 and was part of various peace building initiatives within the UN.